"Given a data set of Black Market Brawlers match IDs, create a piece of software that utilizes the game data from these matches." There were a significant number of entries that focused around stats from Black Market Brawlers. Some focused heavily on stats others on a beautiful presentation. We chose Brawlers Bay as the winner of this category because of a notable balance of both. They explored multiple facets of this game mode ranging from champions, to the new items, and the brawlers themselves. 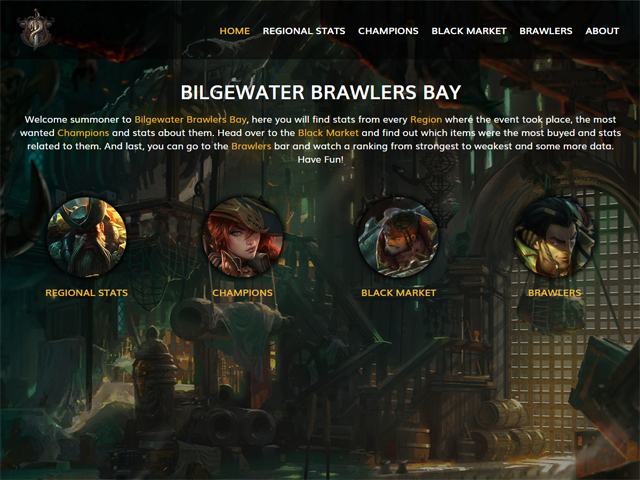 The information provided for these facets were clean and easy to digest giving a great overall picture of the Black Market Brawlers game mode. A demo for their project can be found here. The level of analysis performed within this entry was truly amazing and noteworthy. It became apparent this team made it their mission to dive into every part of this game mode. This entry caught our eye because of it's focus on region more than anything else. The stats were all focused toward that end and we found it to provide insight into each region's meta and how it applies to win rate and item choices. "Given two data sets of match IDs, one before the AP Item changes and another one after, create a piece of software to demonstrate changes in AP Item usage." We saw a lot of sites doing various analysis and comparisons between the patches before Ability Power Item Changes and after. What caught our eye about this entry how clear and easy it was to digest the information and even had the added bonus of a clever visualization of champion clusters based on builds. We found a lot of the entries either focused too intensely on a single topic or too generally on multiple topics. In the end, it hard to get a clear picture of what changed or how ability items were actually affected. This is where this entry excelled. It very clearly gave a view of the before and after and multiple ways of looking at the data before and after for items, champions, and popular builds. There were multiple reasons why this entry was interesting. From the champion selection to the predictive model. Even the application of the model to LCS games was very creative. A lot of good ideas emerged in this entry. 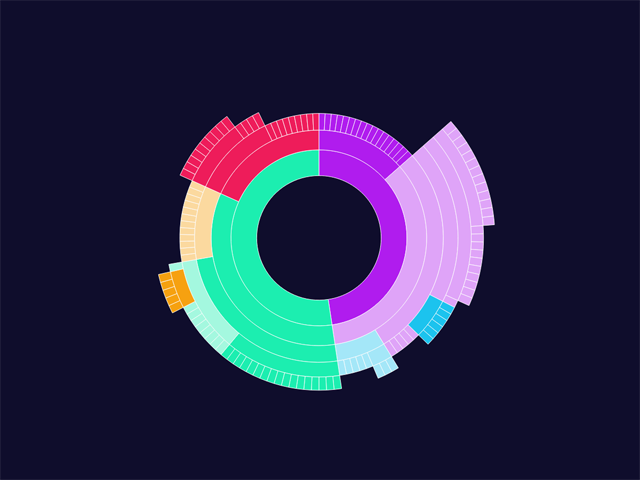 This entry presented data in a unique and visual way. We've never seen a visualization like this and quite honestly were blown away. The presentation of data is an art and this piece nailed it. the recent release of the Item Set documentation." 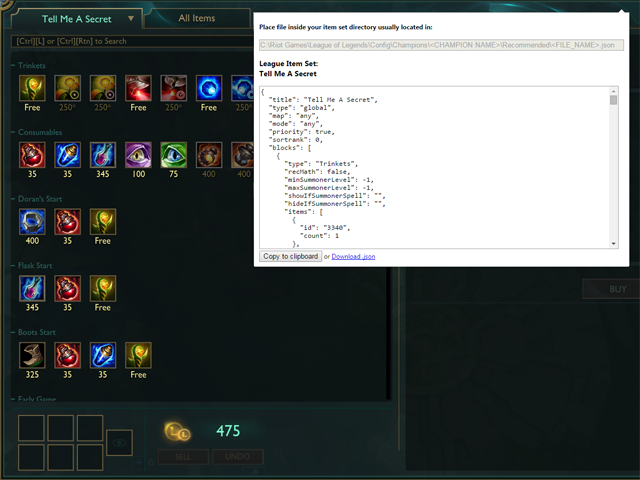 LeagueSets takes a nifty approach to creating Item Sets through a browser extension that automatically generates an Item Set from several websites that offer guides for various champions. The value that it provides for players through the use of pre-existing resources is something we couldn't ignore. This category was harder to judge than previously expected and what made this entry stand out among the others was it's overall utility and it's ability to be continually used on a daily basis. The prompt asked for something that created a benefit for players and this entry has the potential to create a ton of value. This entry went a little above and beyond analyzing champions as well as the item sets themselves to give players a deeper look into what they were building and the stats gained from a specific build. There was no shortage of item set builders, this entry made it a guided experience which we loved. Many of the item set builders packed all the choices on one screen, but this entry spread it out so the user could make clear and easy choices one step at a time.